I love glitter! I love crafting with it. I love wearing it. I love it period! 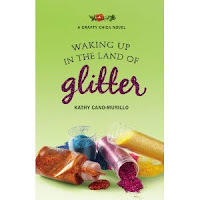 Waking Up in the Land of Glitter: A Crafty Chica Novel by Kathy Cano-Murillo is like being in a tub of glitter. Pure fun. I'm not one to read a book just for fun. I'm not usually a summer book kinda gal. But this was good fun. Sure, there's a good debate about craft versus art, but it's far more a story about a couple of women trying to find their way in life and love. If you know Crafty Chica's arts and crafts, the book is the same fun. Did I mention that the book is fun? Cause it is. In Chicago, we're barely into spring, but it doesn't mean it's too early to grab this summer reading book for your beach bag. Or heck, get it now and pretend it's summer time. Buy your copy at an indie bookstore or Powells.com.